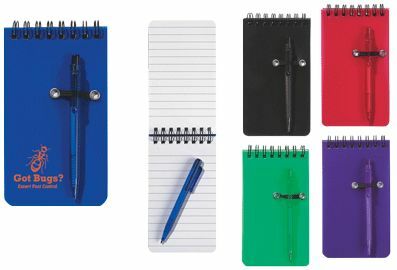 Our wholesale notepad fits easily in your pocket or purse. The spiral pocket notepads include a 50-page lined memo pad and a matching ball point pen. Handy for those messages on the run, these bargain notepads make an excellent give away and fund raising promotional item. Great price, reduced by 30%. Lowest prices in the USA and Canada for wholesale pocket notepads. Free artwork design. American clients pay no taxes. We will send you a proof for your approval before production.